Outer frame of twisted metal accents the hand-forged inner frame in this wrought iron wall mirror. This wrought iron mirror from Uttermost features a heavy outer frame with a twisted metal design. The hand-forged inner frame holds the beveled glass mirror. Great blend of light and heavy styles, as the inner frame seems to float inside the heavy outer frame. Rust wash finish has a warm, aged patina. 26" wide x 35" high x 2" deep. Hang weight is 30 lbs. Glass only section is 19 1/2" wide x 29 1/2" high. Surrounding frame is 2 3/4" wide. Beveled edge is 1 1/4" wide. Wrought iron wall mirror designed by Carolyn Kinder for Uttermost. Outer wrought iron frame with a rust wash finish. Hand-forged inner frame. 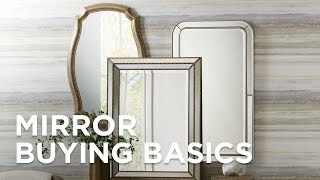 Used this mirror in my powder room I have gotten lots of compliments. Very happy with quality!